Horoscopic astrology is a very specific and advanced type of astrology that was developed in the Mediterranean region during the late Hellenistic period, sometime around the 1st or 2nd century BCE. The tradition of astrology that flourished during this time period is usually referred to as Hellenistic astrology, although there is a distinction between horoscopic astrology and Hellenistic astrology, since horoscopic astrology is simply a type of astrology, whereas Hellenistic astrology is a tradition of astrology. Technically Hellenistic astrology was the first tradition of horoscopic astrology, although there have been many later traditions of horoscopic astrology over the past 2,000 years. The main thing that distinguishes horoscopic astrology from other forms of astrology is the use of the ascendant, and other points that are derived from the ascendant. 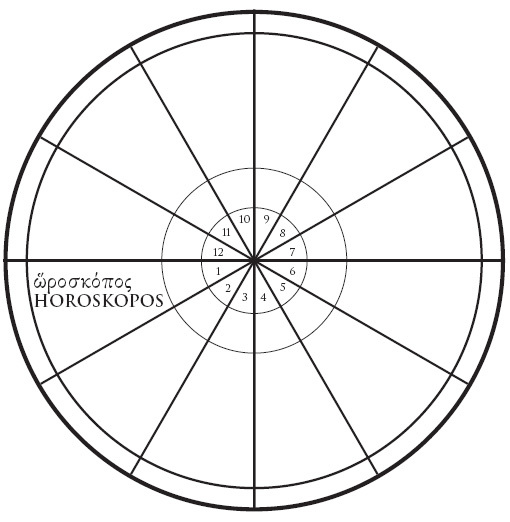 Originally the Greek term hōroskopos, from which our terms “horoscope” and “horoscopic” are derived, was simply a technical term that was used to refer to the “ascendant” in an astrological chart. 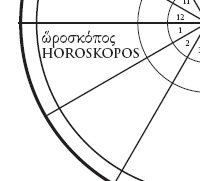 Hōroskopos literally means “hour-marker,” and in Hellenistic astrology the term was used to refer to the ascendant and to the first house in a chart. In modern times the term “horoscope” has acquired a more general usage as a word used to refer to a thematic representation of the heavens set for the moment of a specific event, such as the birth of an individual for example (i.e. a birth chart), or even for the type of Sun-sign columns that you find in newspapers and magazines. However, strictly speaking, horoscopic astrology is simply any form of astrology that utilizes the ascendant. From the ascendant additional factors are often derived, for example such as the system of 12 celestial “houses”, or the system of ‘Lots’, sometimes misleadingly called “Arabic parts”. Since horoscopic astrology is any form of astrology that utilizes the ascendant, this includes many traditions of astrology from the past 2,000 years since astrologers first began employing the ascendant, including Indian astrology, Medieval astrology, Renaissance astrology, and Modern astrology. These traditions of horoscopic astrology are distinct from other traditions of astrology that do not employ the ascendant, such as Mesopotamian astrology, Chinese astrology, and Mesoamerican astrology. All traditions of horoscopic astrology share a similar focus, insomuch as they all attempt to interpret and draw meaning from the positions of celestial bodies at certain moments in time, with the underlying premiss that these positions and configurations have something significant to say about the future of a given individual or system. The general assumption is that horoscopic astrology can be used to reconstruct the past, understand the present, and predict the future. 1) compliment you on our Google/astrology study. I posted a response on Elsa’s blog. Something went wrong (Google/Microsoft fighting each other, using Brazil as their favorite battlefield. This now goes on for weeks). One day we may get some stats. on more then just “astrology” (much of it commercial anyway), but on “Uranus, Neptune Pluto” etc. We need more historic data on those animals. If South Africa figures high in the Google stats, its that about 8% of the population there originates from India. And they don’t marry their children (and many other things they do or hope or fear) without consulting an astrologer, as you certainly know. 2) very intrigued by what you say about “Profections” I looked up some charts, including my own. Born in 1943, I have some distance to analyse. The doubt I have: If 1943 (I am Aries, but have to place my first year in Cancer (Thema Mundi), repeating the 12 year cycle, my next lunar year was in 1955, the following in 1967 etc. What, doing it this way, does not work out is that I will never cover e.g. the years 1950, 1962 etc. (or 1951, 1963 etc) or 1952, 1964 etc. I vaguely remember having read in some Italian or French astrology treaty (or was it numerology?) that this type of sign/planet rulership for every year of one’s life goes by 7 (and not 12) year cycles. Logical, considering the 7 inner Planets. I have run a rapid test this way and found it conclusive, i.e. for my own “universe”. But I may be wrong otherwise. Either I have not correctly understood your text, or you may have to amend something in your explanation. But thought it worth checking out an to let you know.